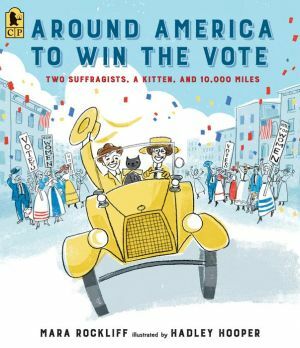 The author of "Mesmerized" delivers another fascinating glimpse into history, this time the story of two brave suffragists on a trek across America to spread the word: Votes for Women! In April 1916, Nell Richardson and Alice Burke set out from New York City in a little yellow car, embarking on a bumpy, muddy, unmapped journey ten thousand miles long. They took with them a teeny typewriter, a tiny sewing machine, a wee black kitten, and a message for Americans all across the country: Votes for Women! The women's suffrage movement was in full swing, and Nell and Alice would not let anything keep them from spreading the word about equal voting rights for women. Braving blizzards, deserts, and naysayers -- not to mention a whole lot of tires stuck in the mud -- the two courageous friends made their way through the cities and towns of America to further their cause. One hundred years after Nell and Alice set off on their trip, Mara Rockliff revives their spirit in a lively and whimsical picture book, with exuberant illustrations by Hadley Hooper bringing their inspiring historical trek to life.